Martin and Gaudencia Rodriguez and their 5 children manage Mimomex Farm in Goshen, New York. The farm is located on 16 luscious acres in the Black Dirt region in Orange County. The region has rich, fertile soil leftover from an ancient glacier lake tucked away in the beautiful Northeast Appalachian valleys and forest. Soons Orchard is in New Hampton, New York and was established in 1910. They grow apples and 20 varieties of peaches and nectarines. A sample share size could be: 5 pounds of apples. Sey Coffee procures the highest quality and ethically sustainable coffee with distinct flavor profiles accentuating all of the natural aromatics. Alejandra and Nestor farm in Red Hook and Coxsackie, New York with the upmost love and care that turn out high quality eggs for the Sunset Park CSA. Borchert Orchards is located in Marlboro, New York and was established in 1919. A sample share could be: 1 quart of strawberries, 1 pint of cherries, 3 pounds of plums, or etc. 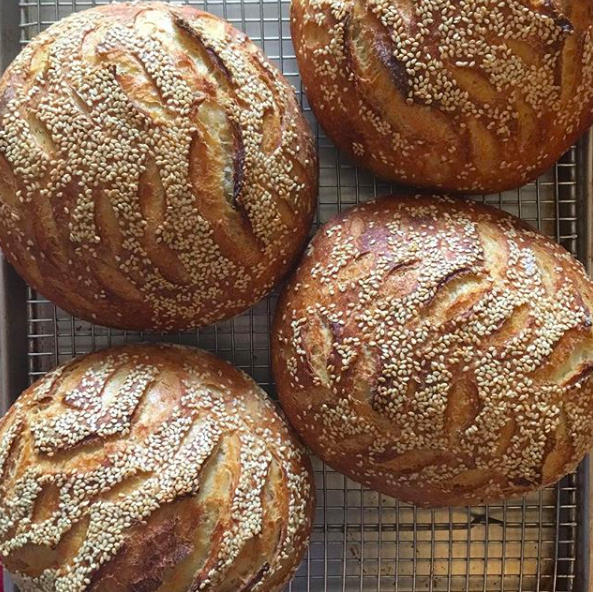 Moonrise Bakehouse is a micro bread bakery born in a Brooklyn kitchen by one of our members. This is real bread: sourdough starter and freshly ground local grains.